Springfield Glass Company sells and installs table top glass for residential and commercial use. 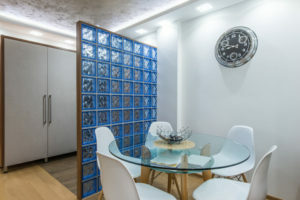 In today’s blog, we will discuss a few things to consider that will affect your selection when picking glass for a table top. The most important consideration for table top glass is how strong the glass needs to be. If the glass will be used just to cover and protect a desk or table top, and it’s fully supported by the furniture itself, the strength of the glass is not as important. If the glass itself is the top, the strength of the glass is very important. Two main factors determine the strength of glass: glass thickness and glass type. Typical thicknesses for glass tops are one-quarter inch or one-half inch. There are numerous other thicknesses available, but these are the most common. Generally, if the glass is just covering the top, one-quarter inch is a good thickness to use. If the glass itself is the top, we will often recommend half-inch thickness for added strength. Typical glass types for table tops are regular plate glass or tempered safety glass. Strength requirements are one reason to pick one over the other. Safety requirements are another critical factor for this decision. Regular plate glass, also known as annealed glass, is what normal windows, mirrors, and picture frames are made of. It breaks relatively easily if subjected to a bending load. It can break into large, sharp, dangerous pieces. Tempered glass has four times the strength of plate glass relative to bending load resistance. Tempered glass is also known as safety glass and breaks into small, less dangerous pellets, as opposed to the large shards. If a glass top is fully supported and does not require as much bending strength, quarter inch plate glass is fine to use. However, if the same top might be dislodged or broken by playing children, quarter inch safety glass would be a better choice in order to minimize the possibility of broken glass injuries. If the top is unsupported, we will typically recommend tempered glass both for strength and safety. In that case, the determination for thickness will be based on overall size. Other things to consider when selecting glass for your table top are the shape, type of edge, surface treatment, and clarity of the glass. See our website for additional information on all the features available. At Springfield Glass Company, we have years of experience providing the best glass solutions for our customers, from commercial doors to residential table tops. Contact Springfield Glass Company today to let us help you pick the best glass for your table top. Give us a call at 417.883.6555 or send us an email at info@spfdglassmo.com.